Current Salon & Color Bar Named Best Overall Hair Salon by Posh Seven Magazine. 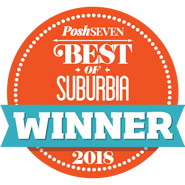 Current Salon & Color Bar was recently voted “Best Overall Hair Salon” in Posh Seven Magazine’s 2018 “Best of Suburbia” poll. Current Salon first opened in Ashburn, Virginia in May 2012, recently moving to its new location in November 2017. “Our new location doubles our previous salon space, allowing us to grow our team and expand our service offerings.” In addition to classic and contemporary cuts and color services, the salon offers a wide array of cosmetic treatments, including permanent makeup, microblading, waxing, threading, Lash Lift & Tint and more. “We understand that hair is only one part of the beauty equation for our clients,” said Ryan Mallard, Owner and Managing Director.